The Center for Security Studies offers conferences, seminar series and webinars that explore cybersecurity and homeland security issues and trends in an open and unclassified format. Speakers and panel members include a wide range of leaders and security experts from the government, industry and academia. CSS events are designed for students, faculty, policymakers, government officials, military personnel, defense contractors, law enforcement officials, interagency and private-sector communities working and interested in the cybersecurity and homeland security fields. 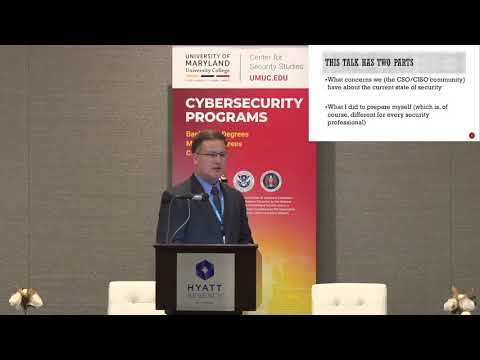 On October 9, 2018, UMUC and the Center for Security Studies, under the direction of Dr. Loyce Best Pailen hosted the Education Track, "What CISOs Worry About," at the 2018 CyberMaryland Conference. The Ponemon Institute's January 2018 survey of the same title set the stage for this year's conference. 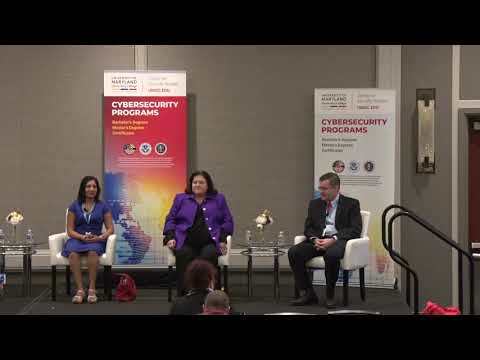 Academic leaders and professionals in the public and private sectors discussed the top concerns among Chief Information Security Officers and how the right certifications, training, and education can help prepare you to deal with threats and job concerns. The sessions were a huge success with more than 90 percent of the attendees surveyed rating the sessions between 4 and 5 on a scale of 1 to 5 (with 5 being "Very Good"). The Center for Security Studies thanks all of program directors, administrators, staff in both the Undergraduate School and the Graduate School at UMUC, along with marketing and the President's office for their support in making this event a success. The support of FBC was outstanding in helping coordinate this effort within the entire CyberMaryland conference agenda. 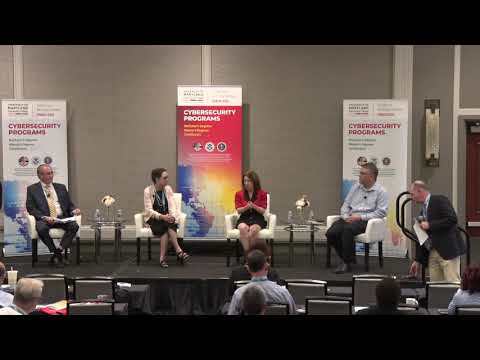 Please enjoy the videos of the four sessions showcasing leading CISOs from the government and private industry sharing their thoughts and experiences on how their educations and backgrounds prepared them for their positions. Loyce Pailen, DM, and Gregory von Lehmen, PhD, open with a welcome to the attendees. Dr. Emma Garrison-Alexander then introduces the keynote speaker, Marcus H. Sachs, CISO of Pattern Computer, who gives his address, "What CISOs Worry About and How They Have Prepared"
Panelists discuss the significant factors in CISOs' careers and education backgrounds, covering areas such as risk management, mobile computing, the Internet of Things, and artificial intelligence. These areas help them address data breaches, disruptive technologies, and other security threats. How does one become a CISO? Panelists focused on how their backgrounds and educational experiences have prepared them to take on the daily stresses of the position, manage a cybersecurity budget, and plan for their professional futures. They discussed the pipeline and offer advice on steps to becoming a CISO. This session centered on how often CISOs rely on academic and non-academic skills related to risk analysis, revenue generation, employee productivity, ethics, customer satisfaction, and cyber innovation. Senior-level cyber professionals also participated in a discussion of life after being a CISO. On October 11–12, 2017, University of Maryland University College was proud to sponsor the education track at CyberMaryland 2017, which included four sessions under the theme Advancing the Cyber Intelligence Quotient. Navigating a career in cyber security requires a fresh and futuristic approach to awareness, education, and training. With the right preparation, the members of the national workforce can become cyber warriors who have an in-depth awareness of the current state of the field and an understanding of the critical issues that the industry faces. Hear from cyber professionals in the public and private sectors, academic leaders, and students about current cyber security challenges and how the right certifications, training, and education can help fulfill the nation's cyber workforce needs. 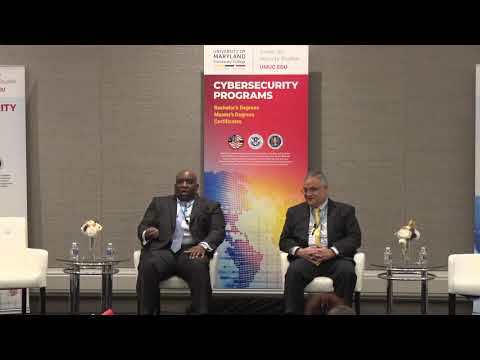 Watch all four sessions of Advancing the Cyber Intelligence Quotient below. 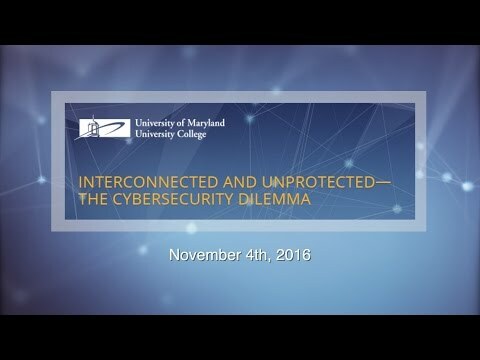 In recognition of Cybersecurity Awareness Month, the UMUC Center for Security Studies hosted this professional development and networking event on Friday, November 4, 2016, at the UMUC Academic Center at Largo. Open to students, faculty, professionals, and the public, the event presented attendees with the latest trends in cybersecurity technology, policy, management, digital forensics, and operations. The event brought together cybersecurity experts from around the nation to speak to these issues and provide insight about the challenges, concerns, solutions, and new opportunities in this vast arena. This UMUC event brings together cybersecurity experts from around the nation to discuss the challenges, concerns, solutions, and opportunities surrounding the pervasive cyber threats in the workplace and in our lives. Our online world has plunged headfirst into reliance upon encryption, but there are subtle—and occasionally disastrous—consequences. These can include lack of visibility to most inspection devices, lost keys resulting in data loss, wrong assumptions about the actual risk to data, and unexpected leaks when the data is not as protected as intended. This talk by Mr. Paul Boin reviews some instructive case studies and lays out guidelines for ensuring that your cryptographic efforts safely meet requirements. 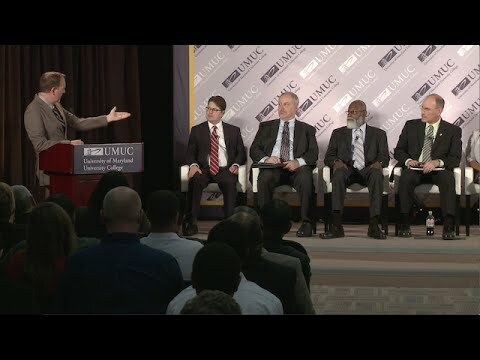 This event, held on October 21, 2015 at the UMUC Academic Center in Largo, Maryland, featured influential cyber security thought leaders who discussed new trends, strategies, and challenges. Speakers included Gerald N. "Chip" Willard, senior technical leader at the National Security Agency, Devon Bryan, vice president of global chief information security services at ADP, Stephen Gantz, chief security and privacy officer at Cognosante, and Richard Smith, information and security officer at Freddie Mac. Learn from leading experts how academic skills and professional expertise present both challenges and opportunities for cyber security professionals. Over a 40-year career, Dr. Mark Pollitt has been a military officer, FBI Special Agent, consultant, and educator. He was the first Agent designated as a Computer Evidence Examiner in the FBI's Computer Analysis Response Team and later became Director of the Regional Computer Forensic Laboratory Program. In this presentation, Dr. Pollitt discusses the applied science of digital forensics—collecting, examining, and analyzing digital content as evidence in criminal investigations—and the long-standing debate over whether IT specialists ("geeks") or law enforcement professionals ("cops") should conduct it. Watch a presentation by Mark Pollitt on the long-standing debate over who should analyze digital evidence in criminal investigations: law enforcement officers or information technology specialists. Emery Csulak is the Deputy Chief Information Security Officer for the Department of Homeland Security. He is responsible for the implementation of the department's information security program. He leads and facilitates information security policy and guidance and architecture requirements for all DHS systems and networks. Mr. Csulak has over 20 years of experience in information technology, information security and management consulting and has been a key leader in the support of DHS since 2004. Webinar: Are We Ready To Defend Cyberspace? The Webinar featured Debora A. Plunkett, director of the Information Assurance Directorate at the National Security Agency. Ms. Plunkett shared her insights about rapidly evolving cybersecurity threats, vulnerabilities and trends. She discussed emerging cybersecurity strategies to protect and defend cyberspace and shed light on the importance of preparing a robust cyber workforce to defend our national information infrastructure. The Webinar on security clearance featured recognized security expert Georgina Obenschain, vice president and director of Security, Science Applications International Corporations-SAIC. Ms. Obenschain shared her insights and useful tips about the security clearance process. Webinar: Cybersecurity—Can Policy Keep Up with the Pace of Technological Change? This Webinar on the state of cybersecurity and governmental policymaking featured Larry Clinton, president and CEO of the Internet Security Alliance. Mr. Clinton addressed innovative policy formulation and implementation strategies in the face of the unprecedented cybersecurity challenges of our nation. This Webinar featured a prominent speaker, Dr. Ron Deibert, director of the Canada Centre for Global Security Studies and the Citizen Lab at the Munk School of Global Affairs, University of Toronto. He offered an in-depth presentation and discussion about the growing geopolitical competition over cyberspace and its implications for global security. Drawing from research of the Citizen Lab, and in particular the Information Warfare Monitor's Ghostnet and Shadows in the Cloud, Ron Deibert shared prominent trends contributing to cyberspace contestation and provided unique perspectives on the broader implications for world politics and security. The Cybersecurity and Homeland Defense Symposium and Job Fair featured a keynote speech and panel discussions by prominent leaders in cybersecurity and homeland defense. The job fair brought together UMUC students, alumni and working professionals with the area's top employers in cybersecurity, information assurance, homeland security, emergency response management, law enforcement and criminal justice. This seminar featured a keynote speech by Dale Meyerrose, the first CIO for the National Intelligence Community and current vice president and general manager for Cyberspace Solutions at Harris Corporation. Attendees included students, faculty, educators, policymakers, government and law enforcement officials, military personnel, defense contractors, interagency and private sector communities working/interested in cybersecurity, information assurance and homeland security. This seminar offered an in-depth presentation and discussion about the U.S. cyber infrastructure, the breadth of our information architecture and how together they prevent security breaches and foreign and domestic attacks.